Using acoustic tracking, this project aims to answer the fundamental question about sea trout’s movements. Like the eel or the much vaunted salmon, there has long been a mystery about exactly where sea trout go whilst at sea. This iconic species loved by anglers all over the world has declined over the last 50 years. To help solve the mystery and hopefully to arrest or even reverse the decline we need to understand the behaviour of these wonderful fish at sea. This cutting edge project using the best available technology will be critical to understanding the behaviour and risk profile of this much loved species. “We hope to influence management practices for the benefit of wild sea trout populations by gaining a more detailed understanding of their behaviour within the coastal environment”, said Adam Beynon-Jones, WSFT’s assistant biologist who instigated the project. 4 organisations are teaming up for this project: – West Sutherland Fisheries Trust (WSFT), Atlantic Salmon Trust (AST), The Scottish Centre for Ecology and the Natural Environment, University of Glasgow (SCENE), and Marine Scotland Science (MSS) – to track sea trout within Loch Laxford, a sea loch on the far north-west coast of Scotland, during the summer of 2018. Sea trout are among Scotland’s most iconic angling species and their presence indicates clean and healthy aquatic ecosystems. Sadly, they are under threat and are listed as a UK Biodiversity Action Plan priority species. Some of the threats to sea trout survival include exploitation, predation, habitat degradation, pollution, and barriers to migration (preventing them from accessing spawning grounds). Additionally, natural sea lice populations can multiply within coastal salmon farms potentially leading to dangerous infestations on wild sea trout. Loch Duart Ltd, (the local salmon farming company) has been instrumental in helping this project get off the ground through the provision of staff and boats. They are fully committed to progressive aquaculture practices to ensure sustainable rearing of salmon. The project has also attracted a massive amount of support from local businesses and estates, undoubtedly reflecting the fact that sea trout are of high importance to these remote rural economies through angling tourism. West Sutherland Fisheries Trust wish to extend their thanks to all concerned, not least to their volunteers who ensure the ground work can happen. The concept for this acoustic tracking project originally stemmed from estuary sweep netting surveys which provide information on the status and health of sea trout populations. These surveys have been ongoing since 1997, and are carried out by West Sutherland Fisheries Trust in liaison with local aquaculture companies, estates, and Marine Scotland Science. Routine visual implant tagging suggests sea trout do not stray far from their native river catchments. This means it is likely that habitats within sea lochs are of great importance to the marine phase of the sea trout lifecycle within this area of North West Scotland. 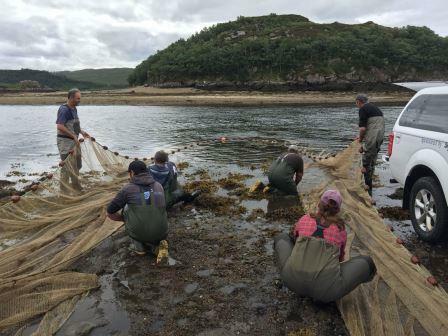 The project aims to discover how sea trout are behaving within Loch Laxford, if they are migrating to the open sea, coastal habitat types of importance, how they interact with aquaculture units, and if sea trout populations across the Scottish west coast are behaving in the same way. It is hoped this will lead to wider implementation of improved management strategies in order to improve conservation of sea trout populations. 40 acoustic receivers have been strategically positioned throughout Loch Laxford in order to provide coverage of different habitat types, aquaculture facilities, and likely migratory routes. 99 sea trout have been fitted with transmitter tags, meaning they will be detected by any receivers they swim near. The receivers will be recovered at the end of October 2018 and the data logged within them will be analysed.